YEREVAN, MARCH 16, ARMENPRESS. An Armenian de-miner, who was wounded during the humanitarian mission in Syria, has been transported to Moscow from a Syrian hospital, the defense ministry of Armenia told Armenpress. 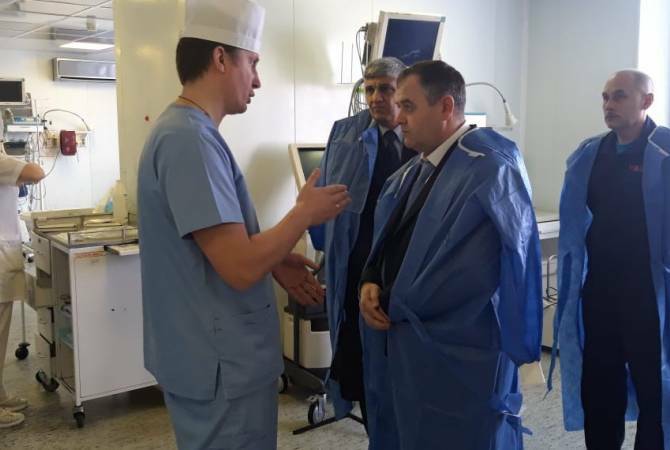 Chief of the General Staff of the Armenian Armed Forces, Lieutenant-General Artak Davtyan visited the wounded de-miner in Moscow. Lieutenant-General Artak Davtyan is in Moscow on a working visit to take part in the session of the Committee of the Chiefs of General Staff of the Armed Forces of the CIS member states. An Armenian de-miner has been wounded on March 7 during Armenia’s humanitarian mission in Syria. A group consisting of humanitarian de-miners, doctors and Armenian specialists ensuring their safety, a total of 83 people, arrived in Syria’s Aleppo on February 8 aimed at providing professional humanitarian support to the Syrian people. The Center for Humanitarian Demining and Expertise told Armenpress that doctors have amputated the de-miner’s right foot wounded after a landmine explosion in Syria.